Feeling the Heat on Taco Wednesday. 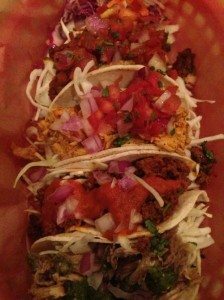 Last Wednesday we thought we would go and visit the much talked about La Choza authentic Mexican street food restaurant in central Brighton. A venue which has been creating quite a stir in the last year. Did you know La Choza was voted ‘Best Newcomer’ at the recent Brighton and Hove Food Festival Awards too? Just over a year ago we were very fortunate to have travelled all the way from Tijuana in northern Mexico, all the way down the Baja Peninsula. We then ventured through mainland Mexico as we went south and east as far as Guatemala. Along the way we stayed with a Mexican family for just over a week as we attended a Spanish course, we discovered what was typical of each region and we enjoyed many different types of Mexican street food along the way. So we were excited to revisit those great flavours and see just how well their Mexican menus had been brought over the Atlantic. On top of that – if it is needed – this restaurant is certainly in keeping with the expanding street food movement. If you don’t know anything about Mexican food then the staple ingredients are corn, beans and chilli peppers. Europeans have had a great deal of influence on Mexican cuisine in the past as they introduced domesticated animals (pork, chicken, beef, goat) dairy products such as cheese as well as various herbs and spices. The offering at La Choza is simple affordable Mexican favourites so, as you would expect, you can find burritos, tacos, quesadillas and tostadas with a choice of fillings and sauces. Food is slow cooked, braised and stewed over time to create complex flavours with an uncomplicated menu. On the rather vibrant La Choza website it invites you to ‘Drop in and enjoy affordable, healthy, and tasty slow cooked Mexican street food’ so this is exactly what we did. It was a Mr & Mrs RB date night and we arrived just after 8pm. We arrived at just the wrong time as dinner guests were flooding in and we were very politely told that there would be a wait of about 45 mins before we could get a table. So we ventured off to the nearby Brighton Tavern for a swift pint, then we were warmly welcomed on our return and seated around on one of their flamboyantly decorated tables. 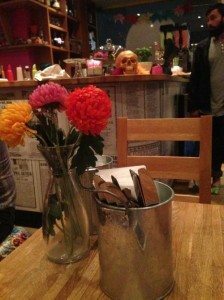 La Choza is decorated from toe to ceiling with a magnificent array of Mexican memorabilia: colours, skulls, margaritas, tequilas, wrestling masks, religious art and much more. We sat in close proximity to our dining neighbours and they were keen to impress upon us their love of La Choza as they told us how they go every week and know the menu back to front. When the waitress arrived we had been thoroughly educated by a ‘La Choza fan’ already and we were quite happy to go with their recommendations. We ordered tortilla chips with a guacamole and sour cream dip to start things off. The quick fix starter was desperately needed at this stage of the evening as it was close to 9.30pm and way past our feeding time. 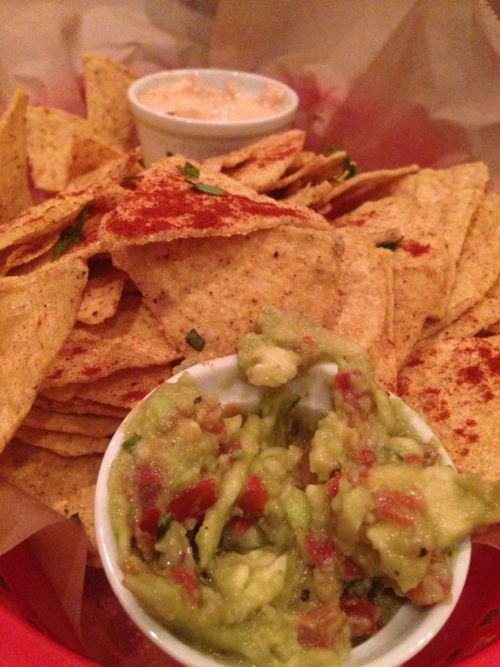 The tortilla chips were fresh and crisp as you would expect and the guacamole was particularly tasty. The key to a great guacamole is to use ripe advocados, the right amount of lime or lemon juice and this guacamole had a little tomato in it to introduce a different texture. I was very keen to find a Negra Modelo on the menu, this is a dark beer, very typical of Mexico and was first brewed by pioneering Austrians. It tasted so good and much better than I remembered. Other drinks options on the menu included frozen Margarita, Desperado, Chilli Beer, Tequila and other native Mexican brands which we have become familiar with. For mains I took advantage of it being ‘Taco Wednesdays’ and Mrs RB went for the quesadilla with pulled pork on our neighbours recommendation, accompanied with a slightly spicy cooked chipotle salsa. 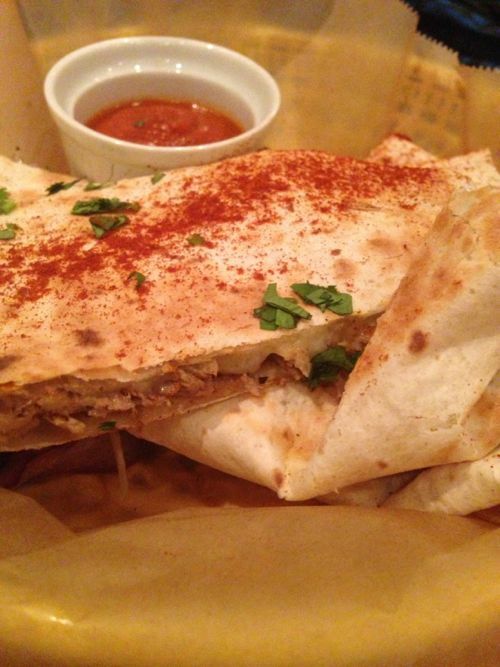 The quesadillas looked and tasted good. These were flour tortillas stuffed with melted cheese and sour cream and the pulled pork just fell a part in the mouth. The pulled pork had been slow cooked over time and you could tell – I imagine the pork was taken from the shoulder of the pig and was soft and tender. To be honest, this was Mrs RB’s dish so I haven’t got much more to say on the matter as it was her main course and she was hungry. She actually said afterwards that she could have easily done another dish as street food portions can be just the right size to fit in your hand. Saying that we did witness a burrito arrive on another table and it had to be taken home in a goody bag as it couldn’t all be finished in one go. Onto my main order, I thought I’d give Taco Wednesday a try so I could experiment with different flavours. This was a selection of soft corn tacos with shredded white cabbage & chopped onion and a selection of fillings and sauces. Pit smoked pulled pork was my favourite filling, though the homemade Mexican chorizo was pretty outstanding too. Sauces included Habenero salsa (very hot), Pico de gallo (mild) and the Green salsa (mild). Now there I was thinking that I was very capable of enjoying a bit of spice, plus I hadn’t really requested anything too hot and I was very surprised by the dishes strength when I started breaking out into what could only be described as a hot flush. There must have been a whole minute or two when the heat hit me, extra mouthfuls of Negra Modelo were required and I had to concentrate on not getting to overwhelmed by it all. My head was sweating through my scalp, my mouth was on fire – so I needed a bit of ‘quiet time’ so I could regroup and put out the flames! Once over the ‘hot’ period we both commented on how the food had really exceeded our expectations in terms of the concept of La Choza. It is fun, simple, unpretentious and different. It gives you a playful venue, a very relaxed and informal environment and it is the sort of place that would get you going back for more. La Choza wins in our opinion too because the team who work there obviously enjoy themselves and the price point is a plus too. Nothing is over priced and our total bill came to about £23 on the night. Be prepared for an elbow fight if you require a wider dining area as the bench format means you get to know your fellow diners, that is unless you get a corner table slot or end up on one of their smaller tables.